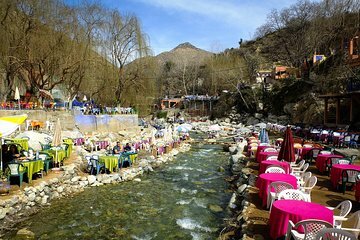 The attractions of Morocco’s Ourika Valley are fairly spread out, making a tour your easiest option for covering them in a day from Marrakech. With this full-day trip, benefit from minivan transport and a guide to tell you about the sights and local Berber culture. Admire views of the Atlas Mountains, follow the River Ourika, visit villages, trek to Setti Fatma’s waterfalls, and enjoy a restaurant lunch before your return.